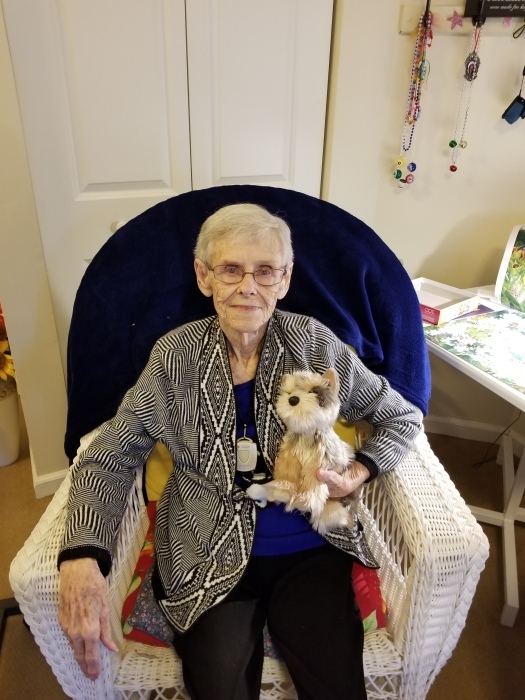 Anna “Doris” Woodlief, 88, of Wake Forest passed away Friday, February 1, 2019. She was born February 24, 1930 in Wake County a daughter of the late and John W. Upchurch and Beatrice (Walrup) Upchurch. Doris was preceded in death by her first husband, James “Jimmy” Young, her second husband, Stancil Woodlief, and her son-in-law Neil Holden. She is survived by her two daughters: Deborah Young Holden, and Linda Young Sandlin; 5 step-children, and David Woodlief who was very special to Doris. The family would like to thank the staff at Brookdale Senior Living, Transitions LifeCare and Leanne Minnick with Dr’s. Making House Calls for all of their loving care and support they provided to Doris. A funeral service will follow starting at 2:00 p.m. in the Chapel of Bright Funeral Home. Burial will follow at Youngsville Town Cemetery.